From time to time I have interviewed members of our chapter so that we can get to know each other better. We lost Wynona to cancer in January 2015. An obituary appears at the bottom of this page. Mary: For those who don’t know you well, tell us about your family and how you got started in music. Wynona: My parents were both musicians – dad a band director and mom a choral director and wonderful accompanist. My three sisters and I grew up as a family orchestra with regular rehearsals and performances around the Waco area. We even went as far as Waxahachie one time! Dad played any instrument and all four sisters played woodwinds, strings and sang. At the present time, the two sisters (identical twins) who live in the Waco area and I are frequent performers for various clubs, church groups, etc. Our sister in Colorado sings and plays flute with us when in Texas and is busy with her music where she lives. Mary: Where did you go to school and what was the best part of it? Wynona: A highlight from Waco High School days was making the Texas All State Band for 2 year and graduating with honors. SMU was wonderful for both my BMEd and MMEd degrees. Undergrad years were filled with friendships, playing first clarinet in the band and orchestra, studying piano with Al Mouledous, pledging Sigma Kappa and being called out to Mortar Board. What I particularly appreciated about the college experience was that each of us was an individual separate and apart from our family background back home. Twenty years later I took a sabbatical from teaching to get my Masters in one year and was recipient of a Meadows Fellowship at SMU. I got to sing in Lloyd Pfautsch’s choir for the first time that year (1982) and learned so much from wonderful teachers such as Herb Turrentine and Tom Tunks. Mary: How did you meet your husband? Wynona: As a first-year teacher in DISD and as a new member of First UMC in downtown Dallas, I joined the choir and the bowling league. One night at bowling a young man came over, sat down beside me, and asked, “How is the little teacher?” We dated for about 2 months and were engaged for 6 months. We’ve now been married for 46 years. Mary: Tell us about your family now. Wynona: Our daughter Michelle lives in Forney with her husband David, a Forney fireman. Their two sons are Joshua, 23, newly released from the Marines and Cody, 11, a 6th grader who loves sports and hunting. Michelle works out of her home for Sprint monitoring technical calls from customers around the world. Our son Chuck and his wife Cheryl also live in Forney. He is a manager of installations for national accounts for Pepsi and Cheryl works for a daycare center. Their oldest son Aaron is 25 and recently returned to the Dallas area from Arkansas. Taylor is 22 this month and a senior at SMU majoring in business/finance. He is handicapped since birth with Osteogenesis Imperfecta, imperfect bones at birth and has had nearly 100 breaks during his lifetime. 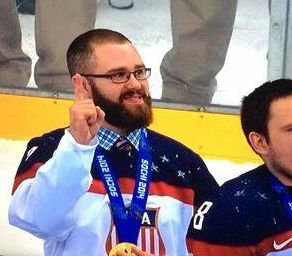 He is a champion sled hockey player on the Team USA for the Paralympic Games and has played in Sweden, Italy, Japan and Canada as well as many venues in the northern states of the USA. He is engaged to be married in July 2009. Kaylee, our only granddaughter, is 19 this month and the mother of a precious little 5-month-old daughter, Mariah Nicole Lipsett-Gonzalez. Note: Taylor went on to the Olympics in Sochi. Mary: You are a pianist, organist, singer, clarinetist and choir director. What do you consider your specialty or favorite? Wynona: My favorite has to be the piano – my first love! I adore playing the Reuter pipe organ at my church in Mexia and I love to sing solos, in groups, in choirs, etc. After nearly 24 years as a choral director, I now let others perform that task except to “fill in” for someone. Mary: You are best known in Mu Phi circles as President of the International organization. Thank you for your dedication to Mu Phi Epsilon and the time and effort you have spent on it. What have you contributed to and taken away from the President’s job? Wynona: Mu Phi has consumed much of my life since serving as Dallas Alumni president in 1970 and attending my first convention that year. It was a thrill to serve as IP and I tried to bring a sense of unity to the Fraternity, as its status back in 1995 was a bit chaotic. I worked with a wonderful group of women on the Executive Board and made so many friends throughout the country. We did a lot of rebuilding of our members’ trust in order to make Mu Phi vibrant, competitive and happy again. The membership files were not in good order and we worked hard to reconstruct a disastrous computer crash that had happened in the early 1990’s. I have taken away from that experience the joy of planning three wonderful conventions and working with leaders throughout the country of other professional music organizations. Mary: What are some special remembrances you have of your time as an International officer? Wynona: Perhaps most memorable was the opportunity to preside over the Centennial Convention in Cincinnati in 2003. That was so awesome! Our annual board meetings were so special and the camaraderie among our officers extraordinary! What a pleasure to represent Mu Phi at such annual meetings as NASM and Professional Fraternity Association. I had the privilege of installing 11new collegiate chapters, 2 new alumni chapters, and numerous reactivations. One collegiate reactivation had 39 initiates! I had the ceremonies memorized in order to make them more personal and special so that I could look into the eyes of each initiate. The International Bylaws as well as the Ritual Book were completely revised during my first term of office – a huge effort withwonderful committees. And I was flattered when our entire board was reelected in 1998 for 5 years in order to carry through to the Centennial event. It was wonderful to meet our members throughout the country and to see their love and commitment to Mu Phi. I was a member of the planning team to organize the Classical Music Hall of Fame in Cincinnati. Mary: What is your vision for the fraternity? Wynona: I would love to see some international chapters, but a new format would have to be devised for such an endeavor. We do have many members living outside the USA and we include many of them as Allied Members. Mu Phi must operate in the most professional venue to attract outstanding collegiate members as well a special election alumni. We must continue to advocate for music education in our country. Finding viable ways to encourage “Mu Phi for Life” is an on-going goal as we lose so many active members after graduation. Mary: What other interests do you have besides music? How do you spend your time? Wynona: We love to travel and have been in all 50 states as well as 19 foreign countries. Genealogy is a passion and I’m learning to knit. Crossword and sudoku puzzles are a favorite pastime and I enjoy researching almost anything on the Internet. There are many opportunities to play bridge as well – I never realized so many women in a small community play bridge! Mary: You moved to Mexia – out in the country – some years ago. What have been the up and downsides of that move? Wynona: We moved to Lake Mexia 15 years ago after retirement. Not knowing a soul in town, we took a leap of faith and have never regretted it. The peace and quiet of living in the country, knowing one’s neighbors, driving the 6 miles into town to run all kinds of errands within a two-mile area never ceases to amaze us! I found out that one can be just as busy and involved in a small town as in the big metroplex area. And how nice it is to see people you know just about everywhere you go. There are plenty of opportunities for me to share my music, and Don loves his flower gardens at our 1½-acre place with over 35 oak trees for the squirrels and birds to enjoy! We enjoy watching all sorts of birds at the feeder and nest boxes, and we marvel at the occasional raccoon, skunk, rabbit, armadillo, snake and possum that pass by – keeping our distance, of course! Mary: Now that you no longer have your demanding duties in Mu Phi Epsilon, what are you involved in now? Wynona: I’m involved in several organizations such as Retired Teachers and Tau Chapter (past president) of Delta Kappa Gamma. I am the current president of the Woman’s Friday Club of Mexia and am an Area Coordinator and State Pianist for Delta Kappa Gamma. The AC job is very similar to a District Director in Mu Phi and I have 15 chapters of women educators in my area of Central Texas to watch over for a biennium. I volunteer at the Chamber of Commerce and read to a kindergarten class weekly. Church activities keep me busy as well. Mary: Anything else we should know about you? Wynona: We miss seeing our family and our long-time friends in the Mesquite/Dallas area on a more regular basis. But we’re only 100 miles away and travel is easy, though busy, on I-45. I was on the 50-year reunion committee for my WHS class of 1957 and I meet every few months for lunch with a group of gals who all went to the same elementary school in Waco and graduated together – such fun we do have! I have joined Curves and look forward to losing some weight and toning up – goodness knows I need it! Almost forgot – I’m a Red Hat lady! Mary: Wynona – thanks so much for your time in answering these questions and for your contribution to our fraternity. NOTE: Wynona left this world on January 2, 2015, leaving behind sorrowful family and friends. Following is the obituary published by the Mu Phi Epsilon Foundation. We are very saddened to have lost a former president of our Foundation, Wynona Lipsett. 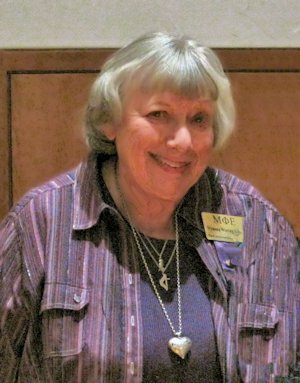 Her obituary is so demonstrative of her outstanding achievements as a woman, a musician, and highly respected, highly honored and illustrious member of Mu Phi Epsilon that I am including it here in this post. Wynona Ruth Wieting Lipsett, age 75, of Mexia, passed away January 2, 2015 following a brief illness with esophageal cancer. Wynona was born at Hillcrest Hospital in Waco, TX, on Tuesday, March 28, 1939, to parents Andrew J. Wieting, a long-time Waco Band Director, and Eldred V. Shaw Wieting, a Waco music educator, choral director, and piano accompanist. She attended SMU on a clarinet scholarship where she pledged with Sigma Kappa Sorority, joined Mu Phi Epsilon music fraternity, was honored by being called out to Mortar Board and received her Bachelor of Music Education degree. She then began her music education teaching career in the Dallas area. Twenty years later she took a sabbatical returning to SMU on a Meadows Fellowship and received hey Masters Degree in Music Education in one year. On June 30, 1962, Wynona married her husband of 52 years Donald Lipsett of Dallas and moved to Mesquite where they established their careers. With daughter Michelle and son Chuck making the family complete, the Lipsetts resided there until late 1994 when Wynona and Don both retired and moved to the Lake Mexia home they have since occupied. Wynona became church organist and was an integral part of the St. Mark music ministry starting and directing the Children’s Choir’s. She was the first choral director of the then-new West Mesquite High School whose choirs won many prestigious awards throughout Texas. She retired after almost 24 years as choral director and is renowned as the composer/lyricist of the West Mesquite High School Song. 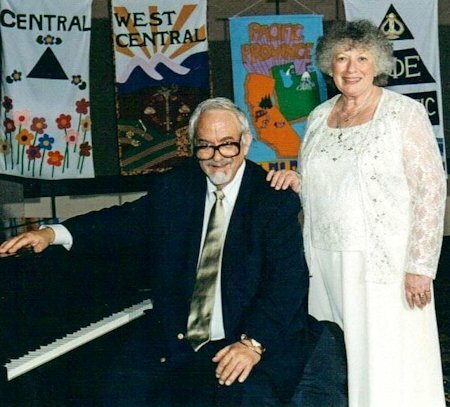 She was also an active member of Delta Kappa Gamma, a professional women’s education society, serving as Area Coordinator over 15 chapters and as State Pianist. As a Mu Phi Epsilon (MPE) member, she served 6 years as International Vice President, as International Competition Chairman, as Province Governor, and as a MPE Foundations Board Member. She was honored to be elected to serve 8 years from 1995-2003 as International President of that very large professional music fraternity with over 75,000 initiated members and around 17,000+ active members. As President, she traveled to 30 states visiting chapters, installed 11 new collegiate chapters and 2 new alumni chapters. She was responsible for revising the international Bylaws as well as the Ritual Book. What she considered one of the most important events of her lifetime was presiding over the MPE Centennial Convention in Cincinnati in 2003. At this year’s MPE International Convention held in Sacramento, CA, in July, 2014, she received the MPE Lifetime Achievement Award, a well-deserved honor which she cherished. Being raised in a musical family, Wynona and her three sisters and parents performed as a family orchestra while growing up in Waco with all of the sisters playing piano, woodwinds, strings and singing. She and her sisters continued all these years as frequent performers for various church groups and professional organizations with Wynona arranging all their musical scores. Wynona has been a lifetime musician whose parents began nurturing her musical talents with piano lessons at age three. She began as a church organist in the fourth grade playing for Junior Church at Austin Avenue Methodist Church. She was an accomplished pianist, organist, singer, clarinetist, choral director, and UIL choral music adjudicator. Wynona and Don loved family traveling until the children were grown then continued that love of travel. They have been in all 50 states as well as 20 foreign countries. Wynona also had a passion for genealogy and much of her travels included research for the Lipsett and Wieting/Shaw lineages developing and maintaining extensive genealogy records as a result. Wynona is lovingly remembered as a loving and dedicated daughter, wife, mother, grand-mother, great-grandmother (Grammy), sister, niece, cousin, in-law, and friend. Many of her friends were life-long from childhood, school/college days and early career associations which have lasted her entire lifetime. Wynona is survived by her husband Donald of Mexia, daughter Michelle Ray and husband David of Forney, TX, son Chuck Lipsett and daughter-in-law Cheryl Lipsett of Forney, TX. Memorial Contributions may be made to: Mu Phi Epsilon Foundation Memorials, c/o Beverly Abegg, 8 Phillips Dr., Westford, MA 011886-3409 or First United Methodist Church, 203 North Canton, Mexia, TX 76667.